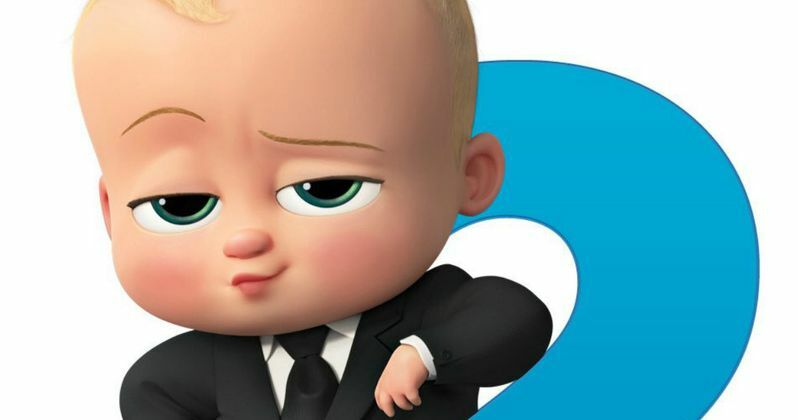 DreamWorks Animation announced today that they are moving forward with The Boss Baby 2, and Alec Baldwin is returning to voice the title character. The studio has also revealed that the entire creative team behind the first movie will return for this sequel, which means that Tom McGrath will be back to direct from a script by Michael McCullers, based on Maria Frazee's hit picture book series. Universal Pictures will distribute this animated sequel, which will be an all-new adventure based on the Boss Baby books, although no specific plot details were given. DreamWorks Animation revealed the first poster for the movie on Twitter today, featuring the beloved title character. The studio has also set a March 26, 2021 release date, which, as of now, is the only movie to stake a claim to that particular date. There is also an untitled Disney live-action movie slated to debut two weeks earlier on March 12, 2021, with Universal's highly-anticipated Fast & Furious 10, the last installment in the studio's high-octane franchise, hitting theaters a week later on April 2, 2021. The original Boss Baby voice cast also includes Steve Buscemi, Jimmy Kimmel, Lisa Kudrow, Miles Bakshi, Tobey Maguire, James McGrath and Conrad Vernon, with Chris Miller, one half of the Han Solo: A Star Wars Story directorial team with Phil Lord, also lending his voice to this comedy. The Boss Baby is produced by Ramsey Ann Naito, although it isn't clear yet if the rest of the voice cast, and the producer, are coming back for the sequel. Still, we have four more years until this animated follow-up arrives, so there is certainly no rush to get production in order quite yet. Still, it's not surprising this is coming together so quickly, given the success of this animated blockbuster. The Boss Baby was a box office hit right away, dethroning Beauty and the Beast and easily fending off Ghost in the Shell and The Zookeeper's Wife with an impressive box office opening weekend of $50.1 million. As of now, it has earned $167 million domestic and $464.8 million worldwide, although no budget figures were given. It is currently the eighth highest-grossing movie domestically, just $70,000 behind Kong: Skull Island for seventh place. Even if The Boss Baby doesn't move up the charts, it's still quite the impressive run, especially since it was sandwiched between the highest-grossing movie of the year, Beauty and the Beast, and the fourth highest-grossing movie this year, Universal's The Fate of the Furious. The Boss Baby centers on a fast-talking briefcase-carrying baby (voiced by Alec Baldwin), whose brother embarks on a mission to win back the sole affection of his parents. In doing so, the brother stumbles upon a secret plot by the CEO of Puppy Co. (voiced by Kevin Spacey) that threatens to destroy the balance of love in the world, and this brash baby executive masquerading as his new brother is at the center of it all. Now, they must come together as true brothers to stop the dastardly scheme, save their parents, restore order to the world, and prove that love is indeed an infinite force. While we wait for more on The Boss Baby 2, take a look at the first poster for this animated sequel.